By the time everything is being changed, so car mount too. Today, there are different types of car mounts available in the market for using different places on your car including dashboard, windshield, air vent, and CD slot. A car mount isn’t much pricey, but using a car mount can help you to get the most out from your Smartphone while you’re driving. As well as, also allows you to use your smartphone legally. You know, it’s pretty much illegal anywhere you go to hold onto your phone at your hand while you drive, it may even cause a serious accident! So, why not choose a certain car mount, especially a magnetic mount. Here’s our list of top 8 best magnetic car mounts below. Simply choose the one you like and make your car driving more comfortable, easier, and safe. 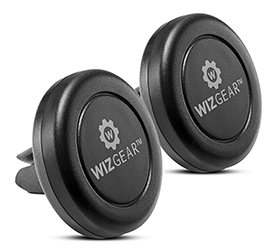 WizGear happens to be the most popular brand in the Smartphone mount industry, and they have various Smartphone holder/mounts for your Car. 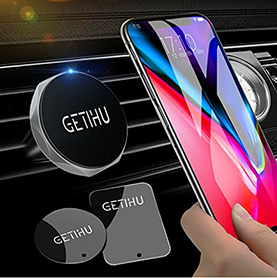 This model is one of the best car air vent phone holders which works magnetically, comes with a very strong magnet and the included metal plate that stick to your phone is not magnetic. So, the magnet itself does nothing harmful to your smartphone. You can even drive with your GPS going all the time as you travel or for work. Nicely compatible with most of the Smartphones including Samsung Galaxy S9/S9+, S8/S8+, S7/S6 Edge, S7, S6, S5, S4, iPhone X,8/7/6/6s plus/6/6s/5S/5/SE, and other Android, Blackberry, and Microsoft devices. In using this mount, there is no issue at all. A universal smartphone magnetic car mount holder for the dashboard, easy to install and use. With 360-degrees rotation, it gives you the ultimate flexibility in rotating your device and swivel your display as you please. Equipped with two types of metallic plates, round, and rectangle. Simply place the plates between the device and its case. Although, you can also stick the plate to the back of your device directly without the case. Just stick it on your car dashboard and you are good to go. The mount also can be stuck on any flat surface such as kitchen, office, bedroom or any areas where you need to hold your phone or keys or anything metal. Compatible with most of the smartphones and mini tablets, including iPhone series, Samsung Galaxy series, and other popular Android devices. 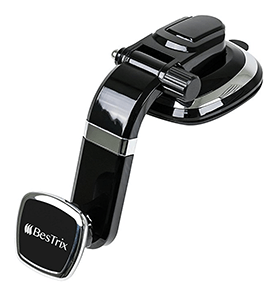 This is the new version – Bestrix Magnetic Car Mount comes with an elegant and revolutionary design that wouldn’t block your view while you’re driving. Very easy to install with the unique suction cup, just make sure to remove all air from underneath before locking the lever. It’ll give your dashboard the luxurious look you seek, also with 360° rotation of your phone display and an arm you can adjust for your convenience. It uses four strong and quality magnets under a silicon surface that hold your phone and keep it safe through every jerk on the road, giving you and your phone a smooth ride every time. This mount is packed with 2 metal plates, just place one between your phone and your case and you are ready to go! There is nothing bad with this magnetic mount, the only issue that it fits all dashboards with smooth surfaces, except leather/faux leather dashboards. Simple, innovative, universal CD slot Cradle-less magnetic mount, comes with hassle-free quick and easy snap-in one hand mounting system. As well as, the full 360 degrees rotation, giving you the ability to rotate your phone the way you love to. Attach the metal plate at the back of your smartphone case or inside of smartphone case or at the back of the smartphone directly. After that, attach your smartphone into the magnetic head and you’re now hands-free, not having to worry about your phone while driving. Universally compatible with all iPhone and Android devices, although a smartphone case is required for use with iPhone X model. 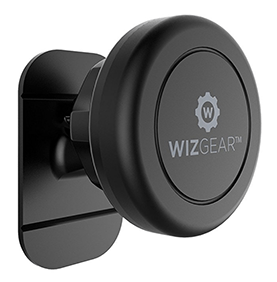 Another one from the same brand WizGear, which is 10 times easier to use than any other magnetic car dashboard mounts. This universal model equipped with the reinforced magnetic holder is what sets it apart from other mounts. 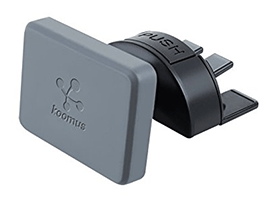 Its magnet produces an intensive force of attraction that will hold your smartphone or GPS device in place, regardless of road vibrations or impacts. Due to its complementary design, it’s not bulky or space consuming at all. Certainly, one of the best magnetic mounts that easily fits into the back of any smartphone, including Android, Apple, Blackberry and Microsoft devices. No issues at all. Great looking Magnetic phone mounts, comes with a powerful magnetism system that you can use on your car air vent. There are included 4 intensive magnetic discs that ensure your phone is firm and safe always, never block the view. The tight prongs design with two different widths makes the mount grip air vent tightly, so do not slip off when you remove the devices. Along with that, it’s 360° horizontally rotatable even on bumpy roads. There is another model with gold color that you can check. Note: the metal plate would interfere with wireless charging. Remove the plate before wireless charging Order with No Risks: 30-Day Money Back Guarantee, 3-Year Warranty, Lifetime Technical Support. a special lock to the air vent that provides extra security so that the phone mount will never fall out. Only 1-minute easy car holder installation fits any smartphone including iPhone, Samsung, Blackberry, and other popular Smartphone brands. Equipped with 4 ultra-strong safe magnets that hold any smartphone securely. The silicon finish surface provides a firm grip on your devices and ensures 100% safe driving whether you are talking, navigating, listening to music or charging. 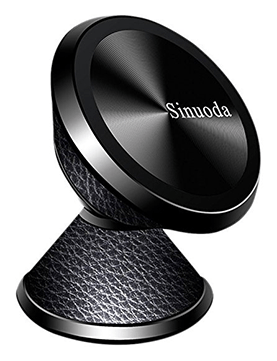 Our last pick is Sinuoda car dashboard magnetic mount, comes with a beautiful and elegant design that increase the beauty of your car dashboard. With 360°Adjustable Angle, it allows you to rotate your Smartphone or swivel your display for your preferred position as you like while you’re driving. You can even use it on kitchen, desk, almost any flat surface. It uses four powerful natural neodymium magnets which provide a strong attraction force that holds your phone steadily even on bumpy roads. Being compact, it’s small and easy to set up and use. This means it will never cover your driving views anyhow. Also, it’s compatible with all size of 4-8 Inches Smartphones including iPhone 7/7 Plus, Samsung Galaxy, etc. Only one thing that could be deemed an issue is the metal plate may interfere with wireless charging. 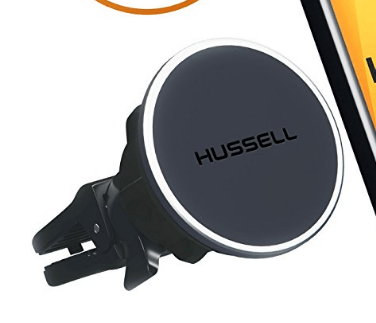 But, overall, this magnetic car mount could be a great choice if you’re looking for a dashboard magnetic phone mount and don’t use wireless charging. However, you can use wireless charging removing the phone from the mount. 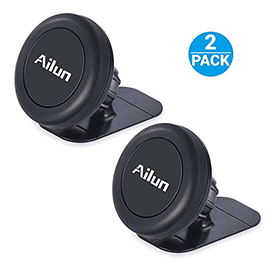 By the way, these are the top and best magnetic car mounts to hold your cell phone or GPS device while you drive anywhere. Hope, this article will be helpful to pick the best magnetic car mount for safe driving while you drive a car with your phone keeping in front. Any of the above mounts could be a nice choice as a gift for someone. I had the WizGear and the Vava before. Wiz one was ok till that plastic cracked by being in the Texas sun. Then the Vava one is just not tall enough to give you enough flexibility rotating, at least not for me. Third one I got was a charm though. I got this CoolBee Gear Aluminum Alloy one and I fell in love with, the magnets in this one are soooo strong, we went rock crawling and it still handled perfectly. Thanks for expressing your thought with us. Obviously, I’ll check that CoolBee Gear thing, and try to include in the list at next update.